For last month’s newsletter, I made a cool couscous salad with tomatoes, cucumbers, carrots, and onions. After the newsletter went out, I received several great responses to my request for couscous salad ideas. Since I couldn’t pick one best idea as the winner of the prize, I pulled the name out of my chef hat. Mary was the winner of my new book, 1001 Miles on the Appalachian Trail, in paperback. I will send the digital PDF version of the book to everyone else who shared an idea. Thanks! The shared ideas are listed at the bottom of the newsletter. Why eat couscous salad on the first day when we can eat it any day? It's so delicious! My boyfriend and I make couscous salad anytime on the trail and it's a perfect lunch-time meal because couscous can be hydrated to a perfect texture with cold water in very little time! Version 1: Couscous with dried tomatoes, peppers, grated zucchini, tons of dehydrated parsley, spices, etc. Just add water in the Ziploc, wait for a few minutes, and it's ready to enjoy on the trail! A bit of olive oil adds an extra kick that makes it even more delicious. Version 2: Couscous, parsley, dried orange (powdered), raisins, cumin, salt & pepper, for a Marocain (Moroccan) taste!! I add seeds for protein: sunflower, pumpkin, hemp, flax, sesame and any other seeds. (The ratio of water to add is 1:1). I hope these ideas inspire you! By the way, I love your book, and I use it a lot! What if, as Fanny suggests, couscous and dried vegetables can be rehydrated with cold water? Of course they can, but I never tried it for backpacking meals. My thinking was that it would take too long, and some of the vegetables might stay a little chewy. For my experiment, I dried several vegetables and legumes, then rehydrated them in cold water, first individually, to see how they behaved, and then together, in a meal with couscous and Chef Glenn’s special sauce. The experiment also provided useful information about the weight reductions of the foods after they were dried. I began with 200 grams of each food: canned chickpeas, canned red kidney beans, boiled corn on the cob, steamed peas, raw cucumbers, raw tomatoes, raw red bell peppers, and raw carrots. 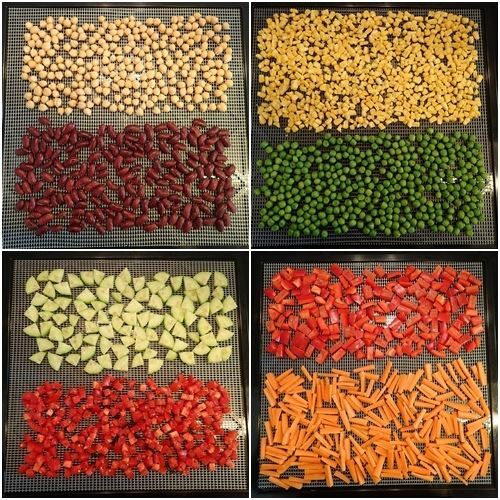 The dehydrator was set at 125 F. The beans, chickpeas, and peas were dry in eight hours, the corn and carrots were dry in ten hours, and the cucumbers, tomatoes, and peppers were dry in thirteen hours. I turned up the temperature to 135 F for the last three hours. Dried weights in grams: chickpeas=75 g, red kidney beans=70 g, peas=57 g, corn=46 g, carrots=23 g, bell peppers=18 g, tomatoes=12 g, and cucumbers=10 g. The denser legumes, having less water to begin with, had the least weight reduction. The tomatoes and cucumbers, having a high water content, had the greatest weight reduction. I covered each dried food item with cold water to observe how they behaved. The red kidney beans absorbed water the fastest of the legumes. The fact that they had split open while drying made them quick to take on water. After an hour, the chickpeas and peas were still pretty hard, as was the corn. The other items were o.k. to eat after an hour. All the food textures improved when soaked longer. 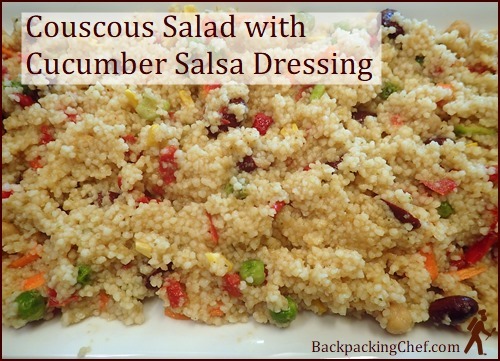 I like the combination of cucumbers and couscous, but since dried cucumbers don’t rehydrate to the same crunchy quality as fresh cucumbers, I made a sauce out of them to use as a flavoring agent for a couscous meal. 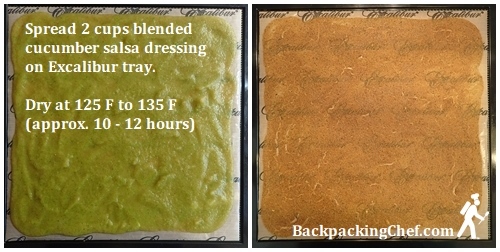 I dried the cucumber salsa leather on the bottom tray of my 5-tray Excalibur Dehydrator with the other items, and the leather was dry in thirteen hours. Unfortunately, it lost its nice green color. Normally, I wouldn’t use so many different vegetables and legumes in one meal, but I wanted to experience the texture of each food that I had dried. It sure was colorful! The meal included ¼ cup cucumber-salsa leather, ½ cup couscous, and ½ cup mixed vegetables and legumes. Two cups of water were needed to rehydrate it in the thermos. Conclusion: After three hours in the thermos, the chickpeas and peas were firm, but not hard. Their texture was welcome in the mostly soft texture of the meal. The red kidney beans were soft-firm, retaining a light chewiness. The corn was chewy, but not hard. The carrots were nice and crunchy. The peppers were almost crunchy. The tomatoes and cucumbers were soft. The couscous rehydrated well. The cucumber-salsa leather turned into a nice dressing. Pack salt and pepper to add to taste. This meal was tasty. It would be perfect for a summer day’s lunch. Using dehydrated ingredients makes it possible, as Fanny suggested, to make it anytime, and not just on the first day of a hike. In recent years, I have met more people who are hiking stoveless on the trail. This cold water rehydration method would appeal to them. It’s also good to know that cold water could be used to rehydrate a meal in a pinch if you run out of fuel. I hope the experiment inspires you to try something similar using your own ideas or those below. See you next month. P.S. 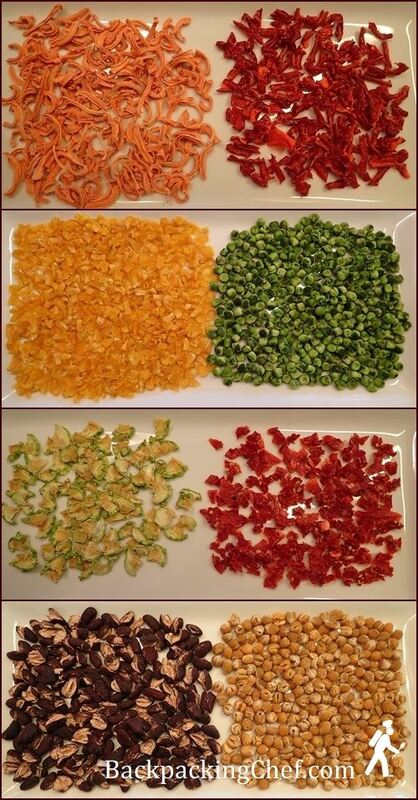 The cover photo shows what dehydrated vegetables and legumes look like after rehydrating in the refrigerator overnight. That's the best way to rehydrate them for home use. Cranberries, pomegranate, mint, chopped orange, green onions, lemon juice, and pistachios. Spinach, strawberries, vinegar, sugar, and sliced almonds. Mango, cilantro, honey, vinegar, and a pinch of garlic. Bell pepper, black beans, corn, garlic, tomatoes, green onions, lemon juice, cayenne pepper, and olive oil. Thanks everybody for the great ideas! Click to purchase my trail journal, 1001 Miles on the Appalachian Trail. Thank you!